Why do more than 370,000 paying customers use DocuSign? Because they love it. DocuSign is the fast, reliable way to make nearly every agreement and approval process a simple digital action, from electronic signing to payment collection—on practically any mobile device, from nearly anywhere in the world. Say goodbye to administrative hassles like scanning, faxing, and overnighting, forever. Close more deals, streamline operations and stand out from the crowd with a far better customer experience. With the most intuitive experience and simple setup, people will love the convenience of doing business with you. DocuSign is a fast way to get an electronic signature, collect a payment, or get an approval from any customer or vendor from almost anywhere in the world using practically any device. 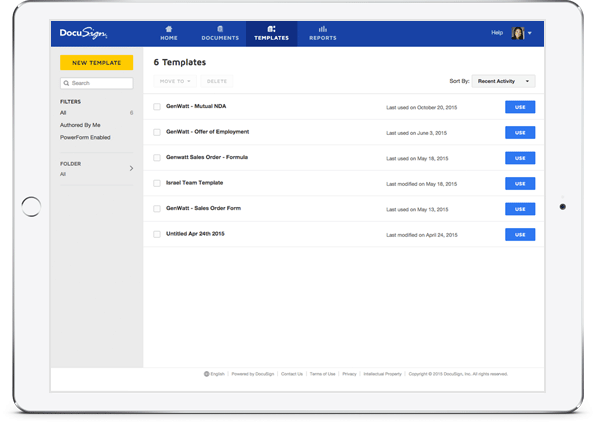 DocuSign fits right into your existing systems so you’ll be productive, instantly. Use DocuSign with over 300 popular services like Google, Salesforce and Box, or access our award-winning app from practically any mobile device. Works with virtually any kind of document. Hundreds of millions of people rely on DocuSign as the eSignature standard around the world. Our technology architecture has enabled us to deliver 99.99% platform availability, ensuring your agreements and approvals are signed and sent. Go beyond collecting legally binding signatures. With DocuSign, you can prepare, execute and manage the entire agreement process digitally—from end-to-end. 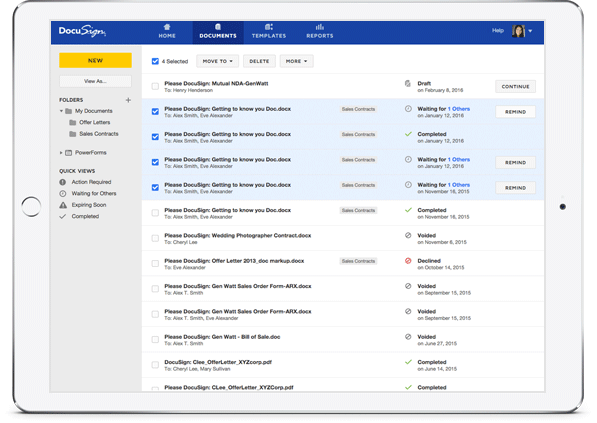 With DocuSign, you can easily prepare agreements using your existing documents and forms in virtually any file type. You’ll save time with flexible workflow capabilities that allow you to automate and standardize critical processes, with the ability to set the order of steps and roles of recipients of any transaction. And robust data controls help you eliminate data entry errors: pre-populate fields, gather and validate data during signing, and push the data you gather to your own systems. Your customers and vendors can quickly access and sign legally binding documents from practically any device in 43 languages. We ensure signers are who they say they are with integrated authentication options. You also have the option to collect payment information and other key data needed to complete a transaction. Get instant visibility into the status of each agreement. You’ll know exactly who signed, when, and where, keeping the process moving forward. 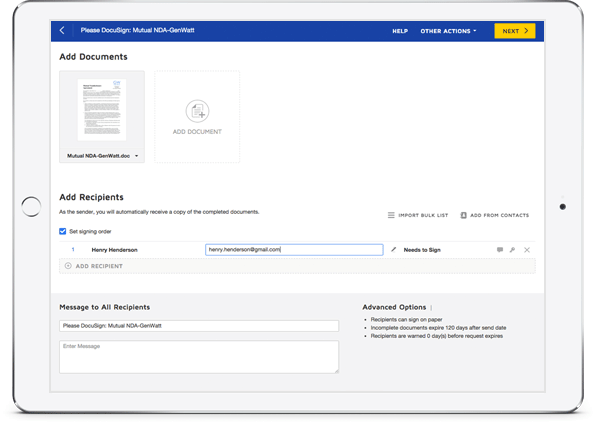 Save each executed agreement in the DocuSign cloud for access to a complete digital record at any time, or transfer to your own systems to comply with company policies. Close deals faster. Keep new hire documentation on track. Accelerate invoicing and cash flow. The sky’s the limit.